Chocolate chip cookies are much like banana bread where everyone seems to have their own favorite recipe and thinks theirs is the best. Most recipes I’ve seen use butter. Don’t get me wrong, butter is G-O-O-D. I love using butter in my recipes. 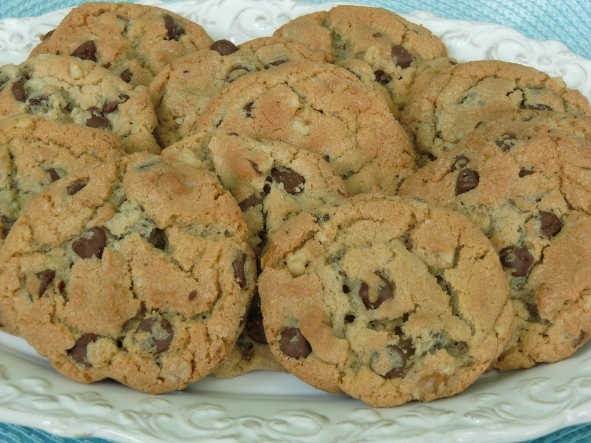 But with chocolate chip cookies, butter makes them not only chewy (which I love) but also a bit greasy on the bottom and they tend to spread more. They are more susceptible to crumbling and aren’t always easy to remove from the cookie sheet. That is why I love that this recipe uses shortening instead of butter. I have no idea where this recipe comes from other than my mom started making them more than 10 years ago when she got the recipe from a friend. 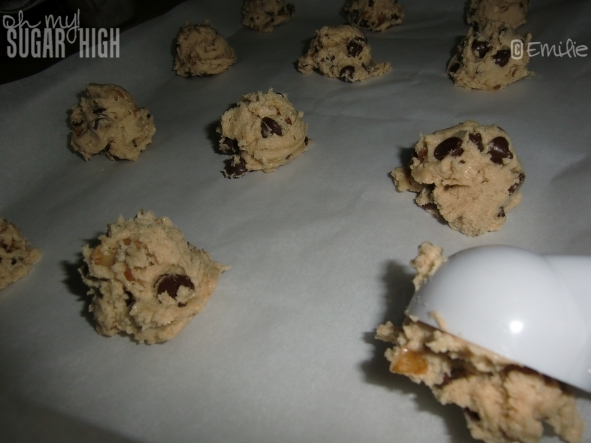 These cookies are firm but chewy and the bottoms are non greasy and so easy to remove after baking. They have a great flavor and texture and freeze great. My husband can’t get enough! The nuts are totally optional and are just there as a personal preference. Beat shortening, brown sugar and white sugar together until creamy. In separate bowl stir together flour, salt and soda and add to sugar and egg mixture. Mix well. Add chocolate chips and walnuts if desired and stir. Bake at 350 degrees for 12-15 minutes or until golden brown, enjoying the lovely aroma now in your kitchen. Cool for a minute or so before transferring to a wire rack to cool completely. 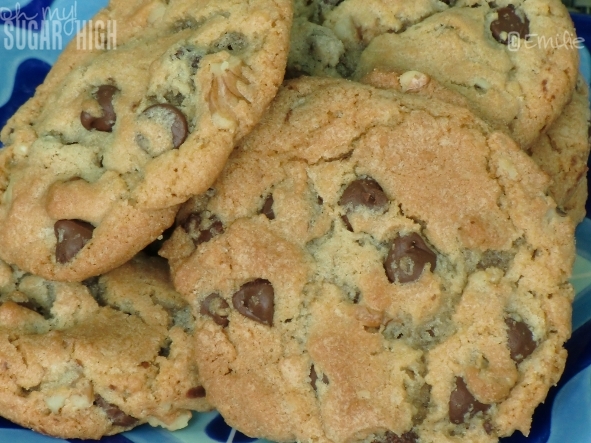 The Best Chocolate Chip Cookies - Really! Drop by tablespoons (or larger if you like) on cookie sheet lined with parchment paper or a silicone baking sheet. Good luck keeping them in your kitchen as they disappear fast! My mother made them this way for years. I got away from that and used the butter recipe on the bag. But still remember the thicker cookies my mother made and how good they were. This year I’m going back to her recipe (the one on this page). I use butter flavor shortening in my cookies, too. I agree that it makes them a great consistency and flavor! I’m going to have to try out your recipe, as well! Looks yum! I was gonna ask about butter flavored shortening. I’m gonna make them for my bake sale this week. 🙂 woot! Thanks. Thanks! printed it out and can’t wait to try it. YUMMY!!! I always put nuts in mine too but I use pecans! Try that sometime. I will definitely try adding walnuts to mine next time. These look so good I may have to make some very soon! Thank you! They look wonderful! And I had to laugh at the “Everyone has their own recipe and thinks it’s the best”. So true! I think every family has their own choc chip cookie recipe passed down, haha! MMM, I agree that shortening makes a yummier cookie! I also use the butter flavored kind.. so good! Love your blog AND I love, love these cookies!!! 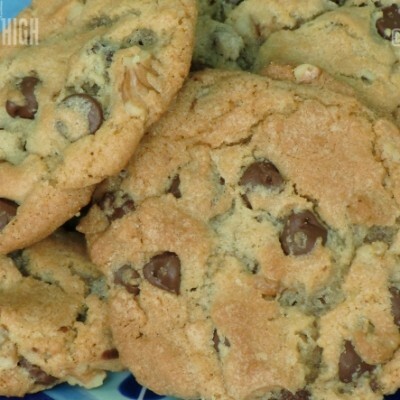 This recipe is a very slightly altered version of the classic Crisco Ultimate Chocolate Chip Cookie recipe. I just discovered it a couple months ago along with the many uses of shortening. I come from an area in California where it’s pretty much a sin to use shortening but sometimes it’s just the best option to keep things perfectly moist! Ssshhhhh….don’t tell the Mommies at our school bakesale!! This recipe was absolutely delicious, amazingly soft, spread perfectly and tasted amazing. Thank you! I am baking a batch right now 🙂 I also pinned it for later reference. Agreed, just made these and they are the perfect texture but are missing that addicting butter flavor. Thanks for the recipie! I just made these cookies 20 mins ago… FANTATSIC!!! thank you!!! Just made these. I will never, ever use another recipe again. Soooo good. And soo dangerous. Thank you for this recipe.???? So happy to hear you love them too! They are definitely addicting which is both good and bad. 🙂 Thanks for taking the time to comment, and I hope to see you around again soon! I made these while I was snowed in and ran out of butter. They were AMAZING!!! By far the BEST chocolate chip cookies I have ever made and I’m about to make them again. Thanks for sharing this recipe! Hope that helps and good luck with your church function! I have been looking for a great cookie recipe for years and this is it! I used butter flavored shortening and have never made more beautiful, tastey cookies. I also added a cup of dried currants and pistachios. The pistachios made the cookies fairly salty, but I like that. This is also great because my lactose free friends can eat them! Thank you!! At long last, CCC with shortening. Thank you! I know they’re delicious!